UPDATE: PATRICK O'Sullivan is out of his coma and attempting to talk to his parents four days after he fell from an amusement ride. Patrick's classmates at Mary MacKillop Primary School were told of the news during a special prayer service. Principal Donaugh Shirley made the announcement. "I have just received a text that has the four words that we have all be waiting to hear - 'Paddy is out of the woods'," she said. "He is out of his coma and is trying to talk to his mum and dad." Mrs Shirley acknowledged the long recovery that Patrick and his family faced. "Whilst this is great news, we know that there is still a long journey ahead for Paddy and we will continue to keep him and the O'Sullivan family in our prayers." EARLIER 10AM: Prep student Patrick O'Sullivan remains in a stable condition in the Mater Children's Hospital this morning. A spokeswoman from the hospital confirmed his condition earlier today. YESTERDAY, 2PM: Family of Patrick O'Sullivan remain by his hospital bed as his recovery from a critical head injury slowly progresses. He has been breathing unassisted for nearly a day but has yet to open his eyes to wake from his induced coma. The five-year-old's grandfather Barry O'Sullivan this morning spoke of the tens of thousands of messages of support that were helping those close to Paddy through the emotionally gruelling wait. "He is off the respirator and he is breathing on his own which is one of those giant leaps when you find yourself in these situations," Mr O'Sullivan said. He said the entire O'Sullivan family were joined in their prayers for Paddy's recovery. "Everyone is just hanging on tight and willing him to open his eyes. "The support we have had from all over Australia has just been enormous." While he was very appreciative for everyone's prayers and thoughts, he wanted to make special mention of the Mary MacKillop Catholic School. "Their support to this family as a part of their community should be bottled." Mr O'Sullivan was very emotional when speaking of the 450 get well cards Paddy's fellow students had sent. He said Paddy's parents, Barry Jr and Emily, had not moved from their son's side for three days. "They are not going without their mate." He was unsure when Paddy would wake from his coma. "This is a journey in increments. "In seconds and minutes rather than anything else." Mr O'Sullivan said he was unaware whether or not Paddy was tall enough to have been admitted to the ride unaccompanied. It was a point which police were also still investigating. Toowoomba district officer Detective Acting Inspector Matt Howard said officers were sorting out statements and paperwork. "We are working closely with Workplace Health and Safety to establish the heights and things like that," Det. Act. Insp. Howard said. 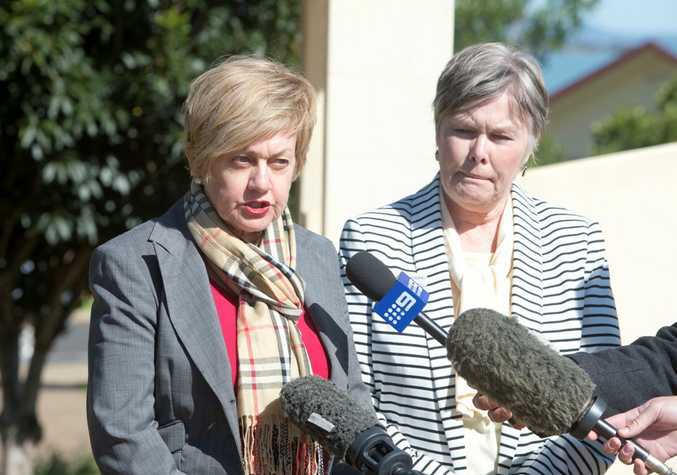 "We will be handing our findings over to Workplace Health and Safety in the next few days." Catholic Education Office Assistant Director Margaret Hendriks the students of Mary MacKillop had been making get well cards and gifts to send to Paddy and his family. "They have also been saying special prayers," Mrs Hendriks said. "Many families and colleagues from Catholic, state and independent schools have contacted the school with messages of support and they have received gifts of flowers, chocolates and morning teas. "The Catholic Education Office and school community expresses its sincere gratitude for this wonderful support." EARLIER: Toowoomba's Catholic Bishop has extended his prayers to the family of Patrick O'Sullivan, the five-year-old critically injured at a school fete on Sunday. Bishop Robert McGuckin said parish priest Father Brian Noonan had been in touch with the O'Sullivan family and was offering pastoral care. "Offering support is very much a part of life in any diocese and this school is in our diocese," Bishop McGuckin said. "Everyone knows each other and it can be a very personal time. "We are pulling out all the stops." Bishop McGuckin said the school was offering counselling services. "Any accident of this nature is horrific, but there is the added dimension of having a child involved." YESTERDAY 3PM: MARY MacKillop Catholic School principal Donaugh Shirley has been overwhelmed with support and well-wishes for critically injured prep student Patrick O'Sullivan. She said the five-year-old and his family had remained in her prayers since he was thrown from a spinning amusement ride at yesterday's school fete. "We are all very upset by the accident, as you can imagine," Mrs Shirley said. "We keep both him and his family in our prayers. "This morning our first priority was the students and the staff of the school to ensure that they were able to deal with this news." She said extra counsellors had been called in to help. "We have been overwhelmed by the support from within our community and outside of it. "In the days ahead, we pray for the family and the full recovery of our little fellow. Mary of the Southern Cross Parish, Highfields, leader Father Brian Noonan spoke highly of Patrick's parents, Barry and Emily. "They are extremely well-valued members of our school community and our parish community," Fr Noonan said. "Our prayers and thoughts have been offered and that is all we can do at this stage." Doctors may try to bring Patrick out of an induced coma on Monday afternoon. YESTERDAY: Patrick O'Sullivan, the grandson of LNP candidate Barry O'Sullivan, was with his family at his primary school fete in Highfields, north of Toowoomba, on Sunday, Fairfax reported today. The prep student was thrown from the fast-spinning ride called The Frisbee about 2pm. Barry O'Sullivan struggled to hold back tears as he spoke of his ''little mate'' outside the Mater Children's Hospital on Monday morning. Little Patrick remained in a coma and in a critical condition. Mr O'Sullivan said the family did not know the full circumstances of the incident. "We have not had two minutes on looking backwards. We are shoulder to shoulder looking forwards and upwards," he said. "We're just not going to allow one cubit of our energy to be involved in trying to think about what might have been, or what has been. "We're concentrating all our will on getting Paddy on his feet." Patrick is the second youngest of four children to Barry Jr and Emily. 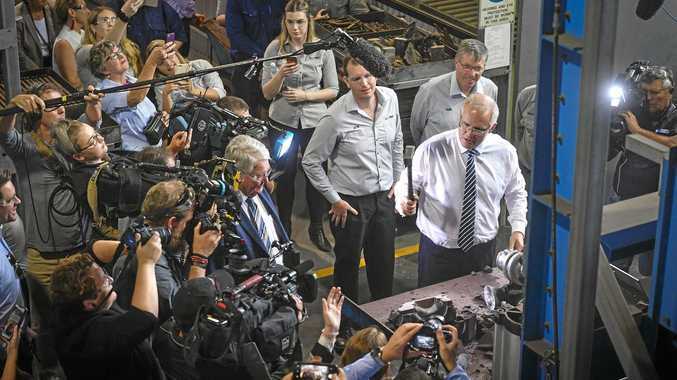 LNP President Bruce McIver expressed his shock. "All our thoughts and prayers are with the O'Sullivan family at this time. 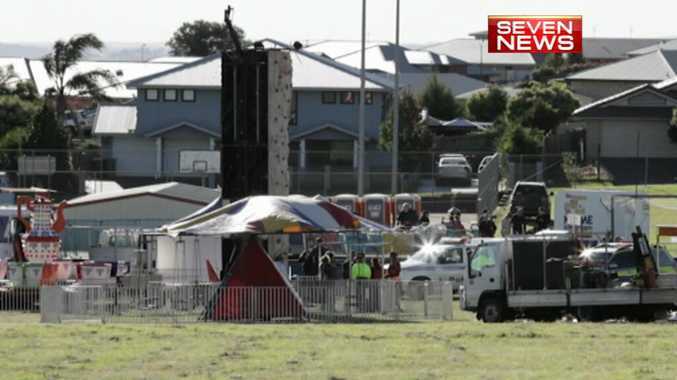 Barry is a very proud grandfather and a member of a very close and tight-knit family"
Police are still investigating how the five-year-old fell from a carnival ride designed for children taller than one metre. There was speculation he may have slipped under the barrier to hold him in, or he could have been flung above it. News footage showed the ride having a minimum height of 130cm. Patrick was thrown from the ride and sustained critical head injuries at the Mary MacKillop Catholic School fete yesterday just after 2pm. It is believed the he was on the ride without an adult. The fast-moving ride pivots around a central column and lifts off the ground. The boy sustained serious head injuries including an open skull fracture. Police detectives, as well as members of the forensic crash unit and Workplace Health and Safety officers are investigating the incident. Police have called for witnesses or anyone with video footage of the incident to come forward. The boy was taken to the Toowoomba Hospital before being airlifted by the AGL Action Rescue Helicopter to the Mater Children's Hospital in Brisbane. He was accompanied by his mother on the mercy dash. SUNDAY: A LITTLE boy is in a critical condition after he was thrown from a show ride at the Mary MacKillop Catholic School fete. The five-year-old came off a ride called 'the frisbee' just after 2pm and sustained serious head injuries including an skull fracture. It is believed that the boy was on the ride without the company of an adult. Police detectives, along with the forensic crash unit and Workplace Health and Safety officers, are investigating how the boy came free of the ride. Two ambulance crews attended the scene to transport the boy to the Toowoomba Hospital where he was met by the AGL Action Rescue Helicopter. The helicopter's flight doctor and flight paramedic stabilised the boy before he was airlifted to Mater Children's Hospital in Brisbane.